As expected, I arrived home late evening. The journey was uneventful, apart from a short stop at the Dartford Tunnels where police stopped the car in front. 'Sandpiper' looks relatively unscathed. A touch of varnish and paint will have her looking almost like new. There was hardly any marine growth on her underwater parts, due to the antifouling. What next? Most likely I shall do one or two local cruises perhaps to the Blackwater - no long-distance road trailering. Altogether on my recent cruise, trailering amounted to 645 miles. That's a long way. Rail travel was a little less than half the distance, and the nautical miles sailed I have yet to calculate. My Pottering cruise has come to and end with many valuable lessons learned. The most valuable one for me was trusting in God. He surely looked after me, kept me safe, and provided me with all my needs. I had the privilege of meeting many lovely people; several of whom helped when I wanted it. Thank you to all of you, and thank you to followers of my blog who have travelled along with me and given me encouragement. 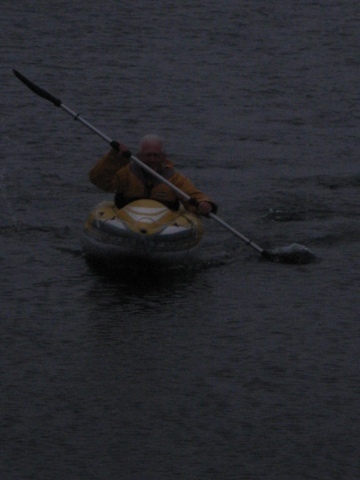 We all know from experience that now and again things do not go according to plan, and the attempt at retrieving 'Sandpiper' on Friday's evening tide proved the point. Because high water was not until 22.10, the boat could not be floated onto her trailer before 21.00. There was a Force 4 from the NW, and the tide was against the wind. This made paddling the canoe to the boat a bit tricky, because she was being blown sideways to the waves. Having boarded the boat without mishap, I thoroughly prepared for proceedings at the slipway where my friend would be waiting. I put fenders out and made mooring lines ready. The plan was for me to berth 'Sandpiper'. Then my friend and I would guide her onto her trailer and haul her ashore with his 4-wheel drive Terios SE. 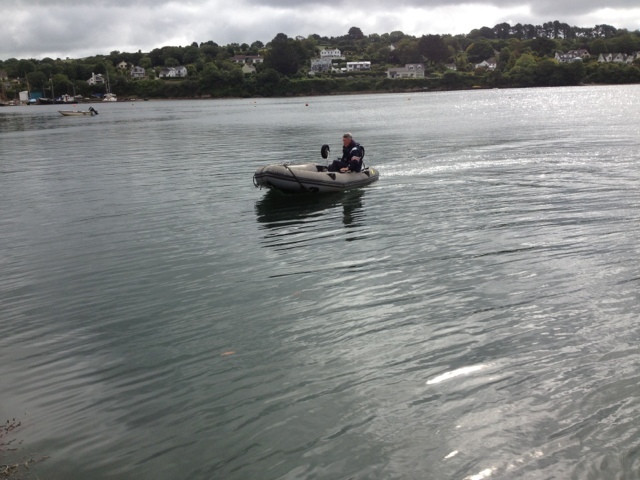 I started the outboard and slipped the mooring, or so I thought! Then I returned to the cockpit and tried moving from the buoy, but no matter what I did, there we stayed. I couldn't work out what was wrong. In fact, the rope loop to the mooring chain had caught around the bow fairlead. At that point the outboard's prop snarled the canoe painter, causing the sacrificial locking pin to break, which meant that the outboard became inoperative. I tried replacing the pin. However, with the minimal tools I had I could not remove part of the pin. There was only one thing for it, and that was to abandon that attempt at retrieving the boat. Back at Point Quay, my friend's friend had been watching events unfold, and he offered to tow 'Sandpiper' to the slipway with his dinghy this morning. Well, the retrieval went well, and I got underway for home at 12.45. I don't expect to arrive there until late evening. 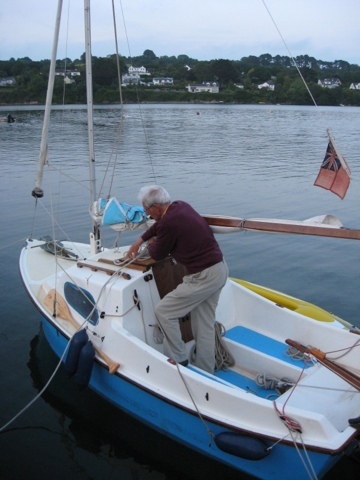 I am including photos of me in my canoe returning to Point Quay after the abortive attempt at putting 'Sandpiper' on her trailer; one of my friend's friend in his dinghy, and another of my friend standing by my boat. 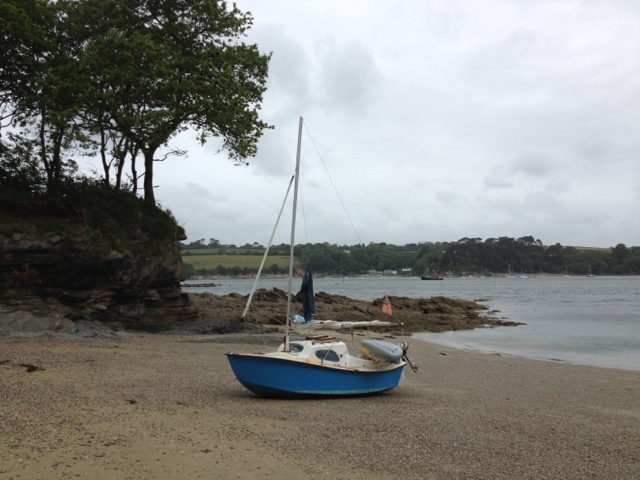 I left home at 07.45 and arrived at Point Quay, Percuil Creek at 15.30. There was a small hiccup that could have been serious. Fortunately I discovered the nut and bolt holding the numberplate had parted; therefore I used one of the boat strops to hold the numberplate to the trailer. My friend found a nut of the right size, and to stop the same thing happening again, he wound twine around the end of the bolt. High water will be at 22.10; therefore I may be able to retrieve 'Sandpiper' and sort her out tomorrow morning before trailing her home. Getting into Restronguet Creek an hour-and-a-half before high water went well. Only a short distance from Point Quay did the centreplate touch. I had to lift the rudder and steer with the outboard. My friend turned up on time at 19.00 and we loaded the canoe onto his car. Five minutes later we were drinking coffee at his home. The evening meal at a local restaurant with my friend and his wife was excellent, being well cooked and well presented. We had a great time together. Back at the boat I adjusted the lines for a 3 metre drop of water. Only once during the night did I have to check them to make sure they were not too taught. I was rewarded with a moonlight scene. On a rising tide this morning I readjusted the lines. 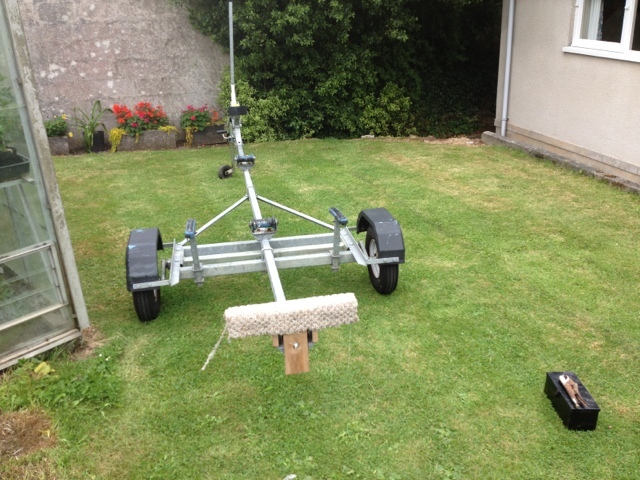 When the water was high enough for putting 'Sandpiper' on my friend's friend's mooring I cast off and started the outboard. 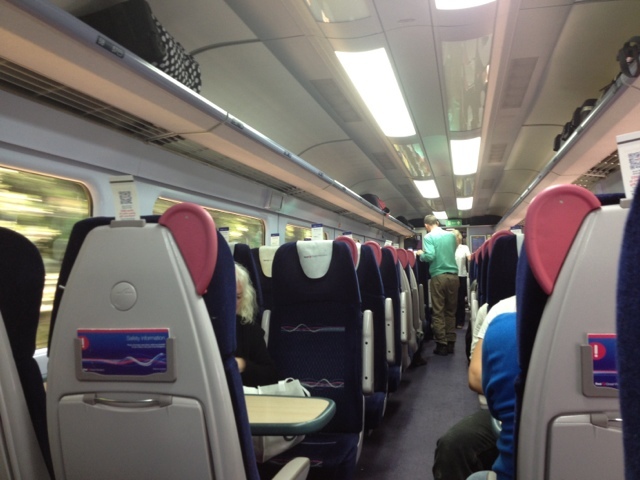 I'm writing this at mid-day on a First Great Western train going to Paddington Station. From there I shall travel by Underground to Liverpool Street Station, where I shall board a train bound to my home town. The whole journey will take the best part of a day. driving the car with the boat trailer in tow, en route to Point with the purpose of retrieving 'Sandpiper' on the evening tide. This looks like the last day of the cruise. Early this morning when the mist lifted, I paddled 'Sandpiper' out of Tolcane Creek, and allowed the ebb to take us south past wooded Turnaware Point where a zephyr warranted making sail. The silence was broken by the call of birds; first a pheasant, then a wren, a wood pigeon, a crow and a chiff-chaff. I had this part of the Truro River to myself. Slowly the wind picked up and came in from the SW which had us on the wind, but there was no strength to it. Once again I anchored 'Sandpiper' more or less where she had been yesterday - at St. Just Pool. A hazy sun gave a hint of promise for more brightness, which was the case until mid afternoon. From there on, there was a light covering of greyish cloud, enough to cool the air. Landing on the beach was easily done, since the water was almost like a millpond. Because my canoe is an inflatable I have to take care not to puncture her. Just before arriving at the water's edge, I kneel facing forwards, then I step over the side. As soon as I am established with firm footholds I lift the canoe out of the water and carry her to a point above the high water mark. 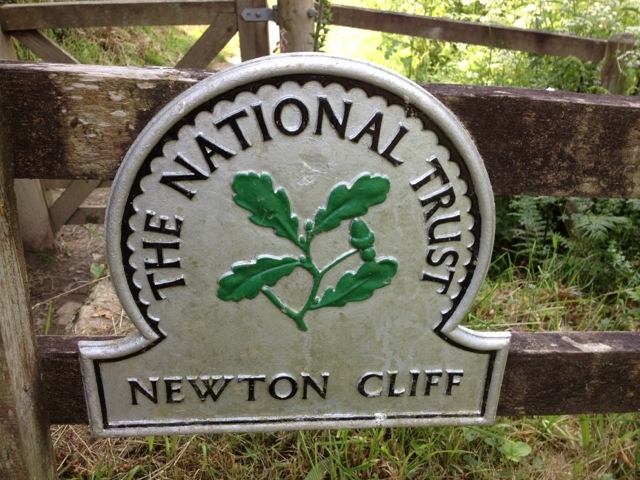 The 2 mile footpath from St. Just to St. Mawes is well worn. At this time of year many people use it, and cattle, too! I love combining my small boat cruising with walking, and for as long as I can remember I have derived great pleasure from the exercise and from things I see and experience. Today was no different. 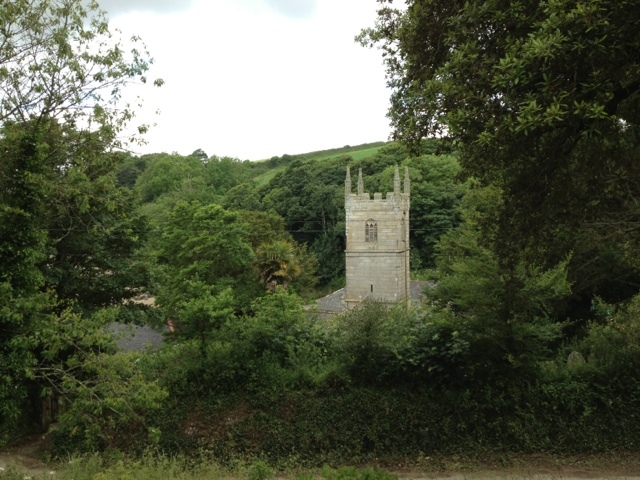 In fact, walking to St. Mawes and back was as good as it can get. 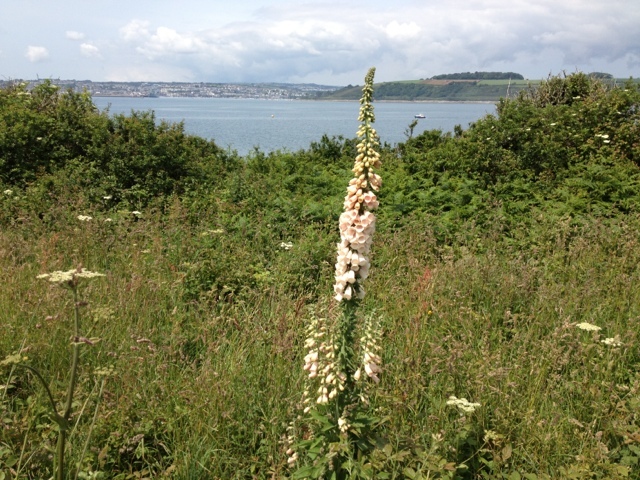 The coastal path runs through 'set aside' farmland, which I think is brilliant, because insects and wild animals have a really rich environment for their preservation. 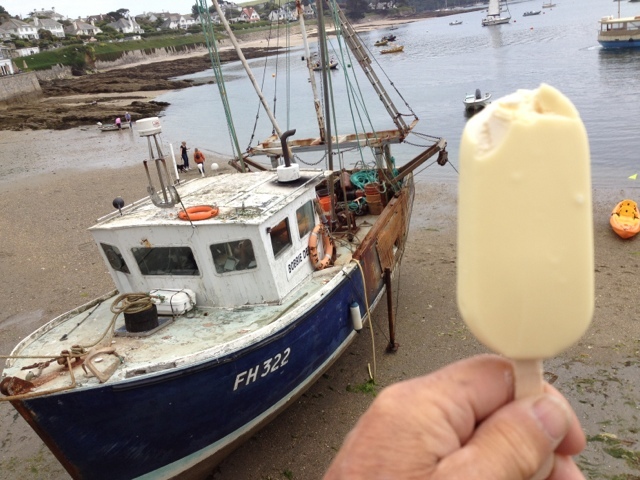 One reason for visiting St. Mawes on foot was to repeat what I did when I sailed there with 'Ladybird' two or three years ago; that was to buy and savour a White Magnum ice cream! My wish was satisfied. 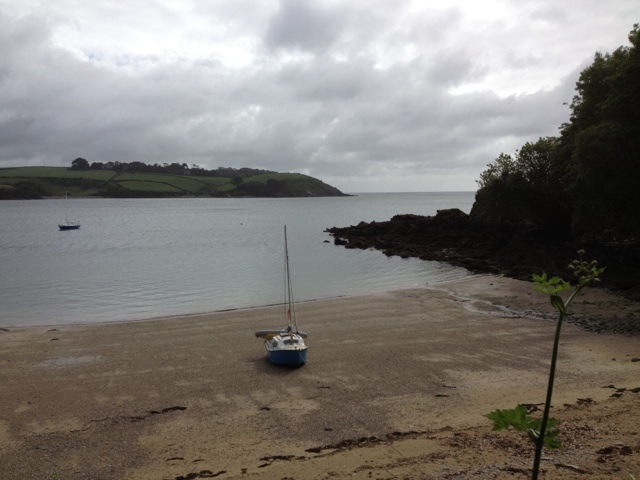 My plan is to put into Restronguet Creek for the night; then to return home by train tomorrow. I'm having a relaxing day. 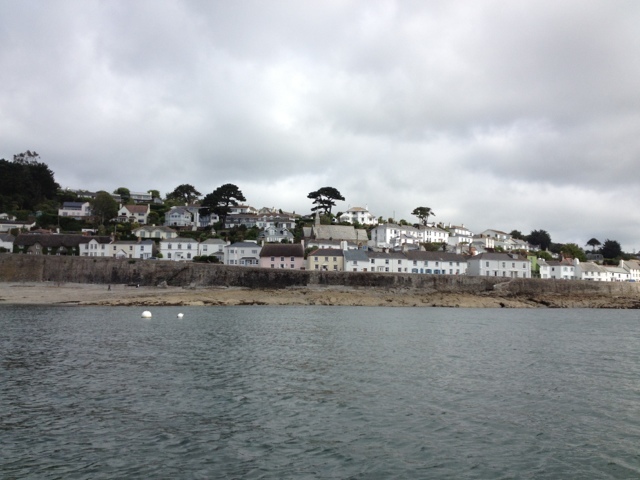 After a leisurely start I had a gentle sail to St. Mawes and continued to St. Just-in-Roseland, where I anchored in a pretty bay. As I finished lunch Mick drew alongside in his super Drascombe Dabber. 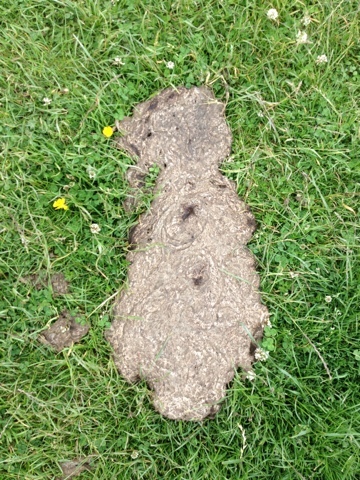 He thought I might be John whom I met yesterday at Helford River. Mick and I had an interesting chat. He had been a follower of my old Small Sailboats website. 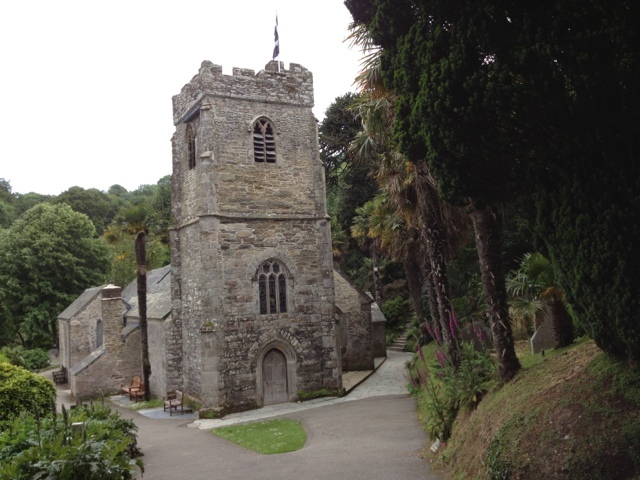 After he set sail for his Falmouth mooring, I paddled my canoe to the beach and walked to the parish church of St. Just-in-Roseland. 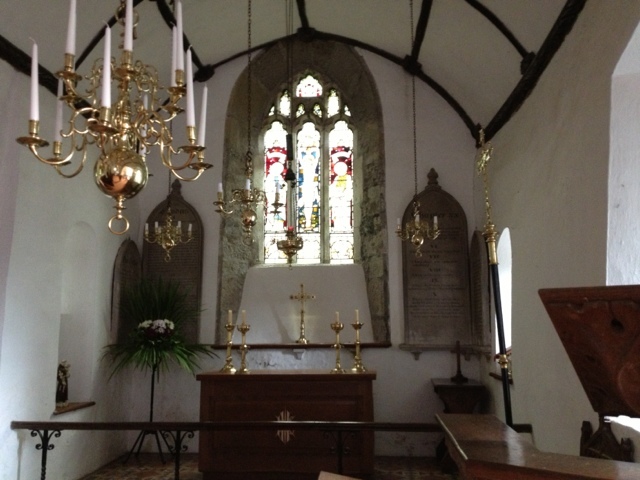 The setting for this church, tucked away by St. Just Creek, is most beautiful. There, it is surrounded by gorgeous old trees and lush vegetation. What makes the building so special is the obvious care that has been lavished upon it, and this same care continues today. I particularly like the stones etched with Bible texts that are set on both sides of the pathway leading to the church entrance. 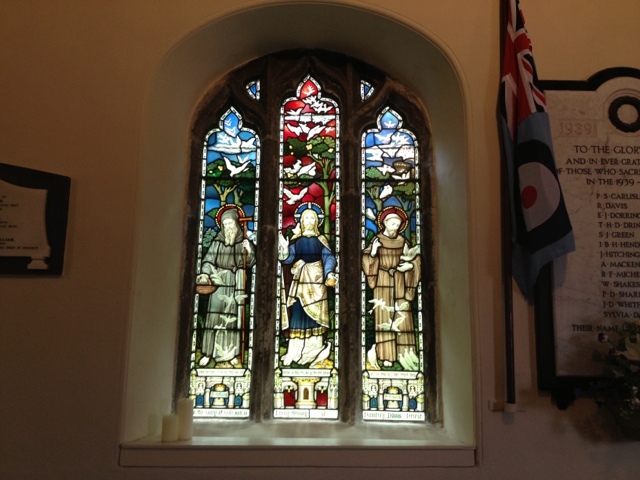 Inside the building there are splendid stained glass windows depicting biblical characters and captions explaining their contexts. 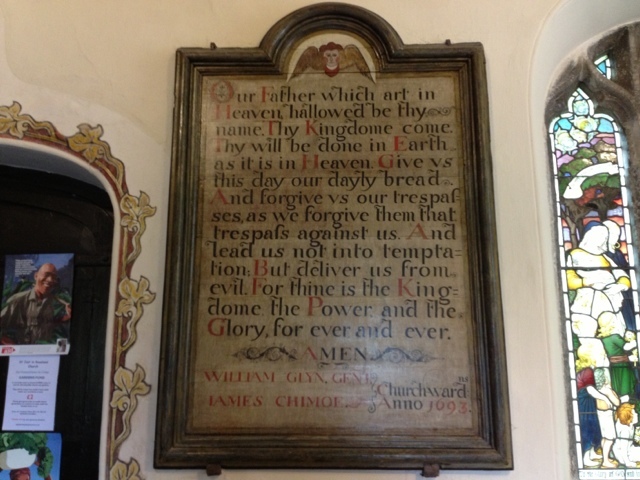 The Christian Creed and the Lord's Prayer are set out in full on framed presentations either side of the Church. 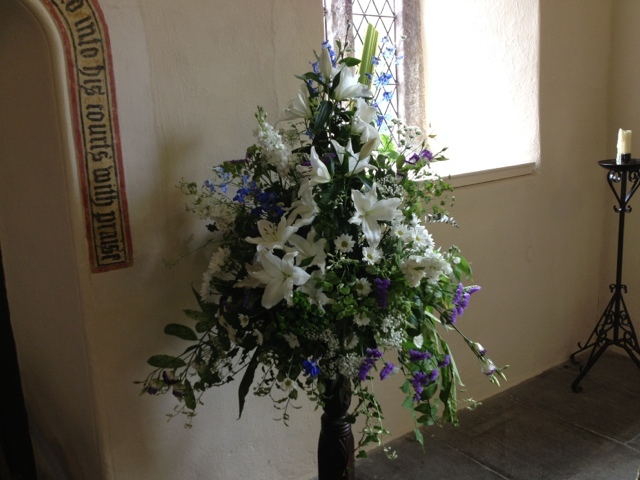 The most astonishing floral arrangements are also on display. Perhaps they were for a recent wedding. As I write at 16.00 I have yet to find a comfortable anchorage for the night. I feel the cruise is coming to an end, and I am winding down. Last night was pretty rough. My intention was to move to Abraham's Bosom, a well protected spot at the opening of Porthnavas Creek, but the strong NW wind put paid to that by causing steep breaking waves, one if which lifted the bow and thrust the boat back into a trough, dunking the engine. The end result was that the engine stalled. Under those conditions I could not get it to restart. 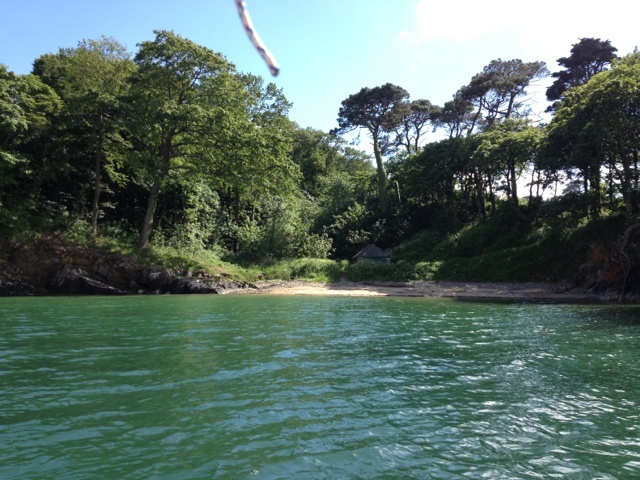 By sailing with a reefed jib I steered towards Durgan on the north shore of Helford River; there I picked up what I thought was a mooring; however, it was a marker for a mooring and it couldn't hold the boat. I dropped it and let go the anchor which did not hold on account of kelp. Fortunately 'Sandpiper' drifted alongside a sturdy Falmouth Pilot Cutter to which I rafted and stayed there for the night. Apart from the shelter offered by Abraham's Bosom, my other reason for trying to get there was to meet John, a member of The Dinghy Cruising Association. He has a 'B' Type West Wight Potter. This morning we met on the River. He anchored 'Firebird' and I brought 'Sandpiper' alongside. 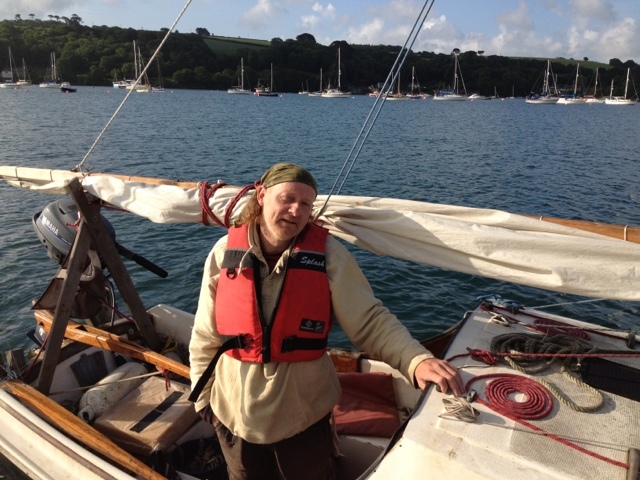 We had an hour's chat swapping yarns; then we sailed together into Falmouth Bay. 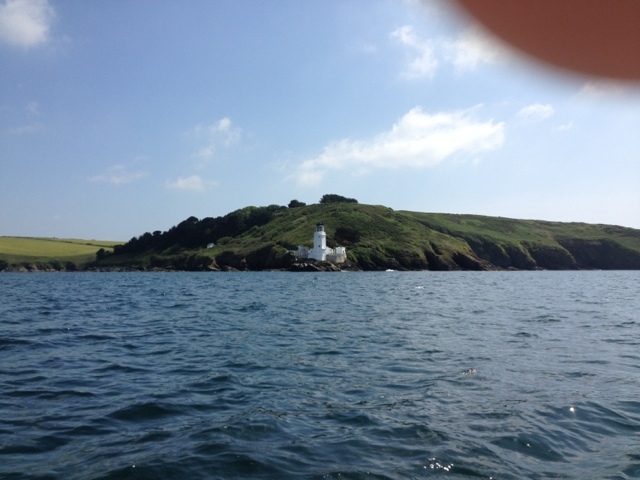 He anchored at Maenporth and I continued to the anchorage at Falmouth. I made full use of the excellent facilities before shopping for odds and ends, including pants and socks which were in short supply! I didn't bring enough. I'm hoping for a peaceful night, unlike last time I was here. As I write (11.15), the wind could be a Force 7 from the NW. Understandably I opted to beach the boat once again at Bosahan Cove. She is not fully protected from the wind as she was yesterday when it came from the west. I packed myself a lunch and set out along the coastal path towards St. Anthony. 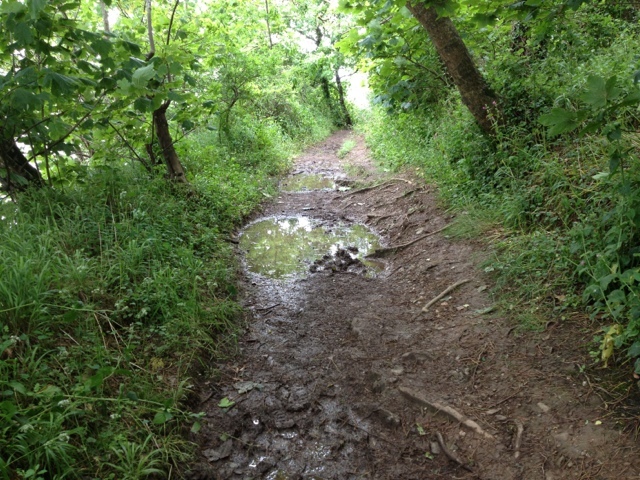 I discovered that the path was as boggy in this direction as it was towards the village of Helford. Views overlooking Gillan Creek are fabulous. I'm on the headland that protects the creek from the north. Here there is a viable phone signal. I'm hoping to meet John who is at Fisherman's Creek with his Potter. Maybe the wind will die down enough for us to join forces. I'll leave you with photos taken this morning. Last night there was a raging gale and much heavy rain, but 'Sandpiper' was completely protected in the lee at Bosahan Cove. 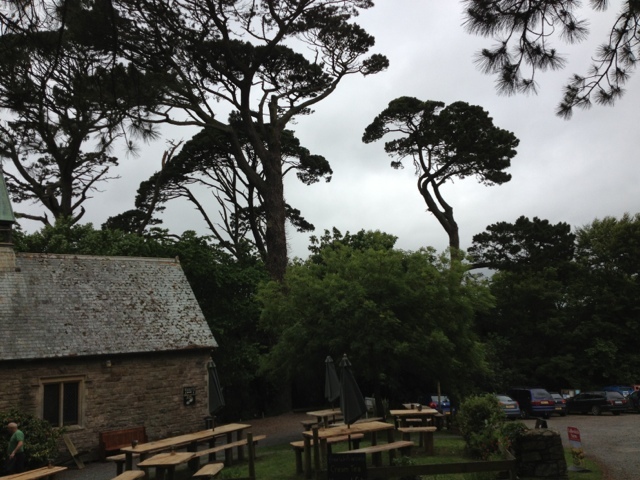 The gale continues as I write at 13.00, Saturday, 22nd June. I monitored the critical moment when the boat floated off the beach at 02.35 this morning. Both fore and aft anchors held. I returned to my bunk, somewhat comforted. A feature of this rocky and hilly area is the wonderful and ancient Pine trees. 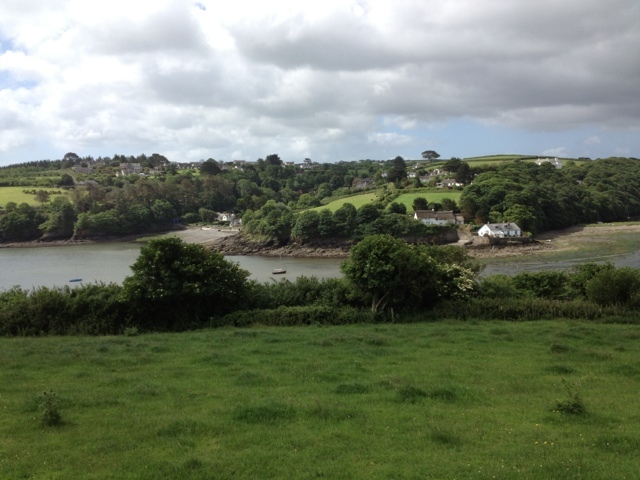 The coastal path flanked by these trees and dense woodland passes through the picturesque village of Helford. The short stretch between 'Sandpiper's' temporary home on the beach and the Village is exceptionally wet and muddy. Not equipped with hiking boots, I had to take great care not to ruin my suede shoes. 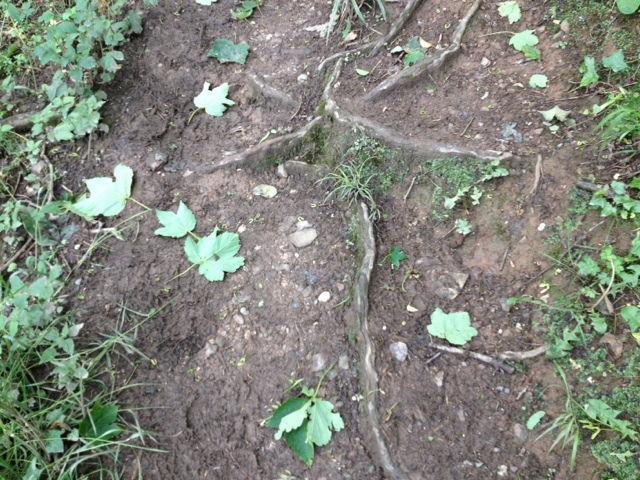 In places the mud was slippery, and a stick I found came in handy for helping me to maintain a foothold. Several walkers were doing this part of the Coastal Path; most stopped for a chat. Back at the boat before a short-lived drizzly shower I set to cleaning a spare spare spark plug for the outboard; then I lay down on my bunk and listened to the swishing sound of the wind as it battered the trees. The soothing sound of wavelets licking rocks either side of the cove soon lull-abided me to sleep. The forecast for Sunday is not much better than today; therefore most likely, I'll stay put. Today has been one of the best. 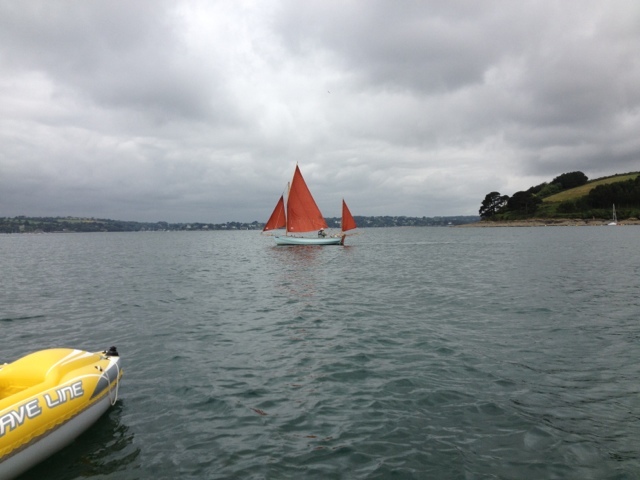 While anchored at St. Mawes I watched the start of the 3 Peaks Race. 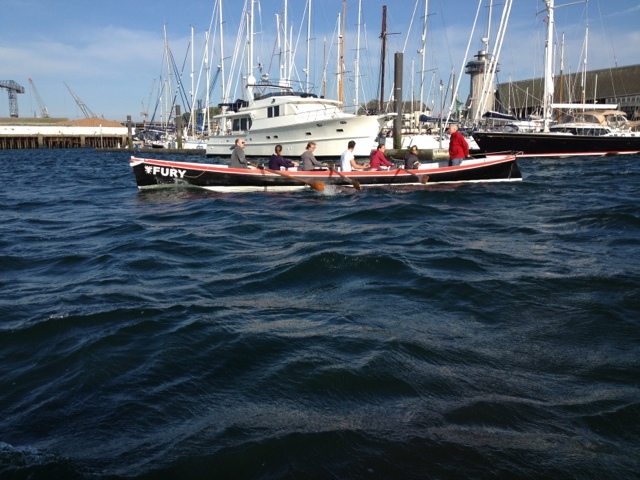 Two runners from each of the six boats had to do a short run, then row to their yacht before setting sail. No 3 had a clear start, and was well away before the others. The all girl crew on their catamaran, No 1, were the last to get away. I took note that my friend's son's trimaran did not start. I didn't see them at all. 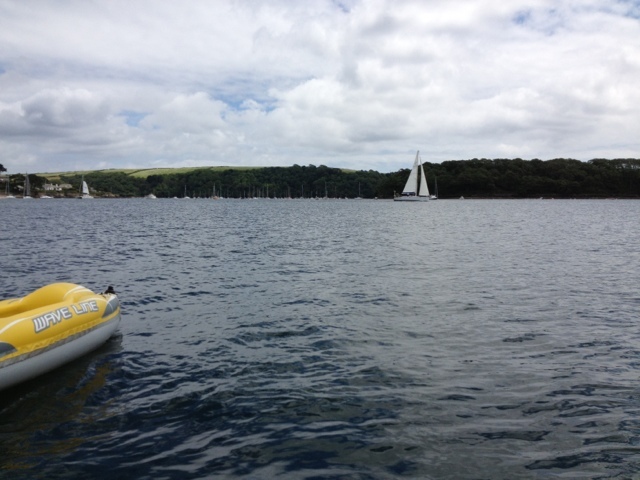 After all the racers set off, I too made sail for the Helford River. 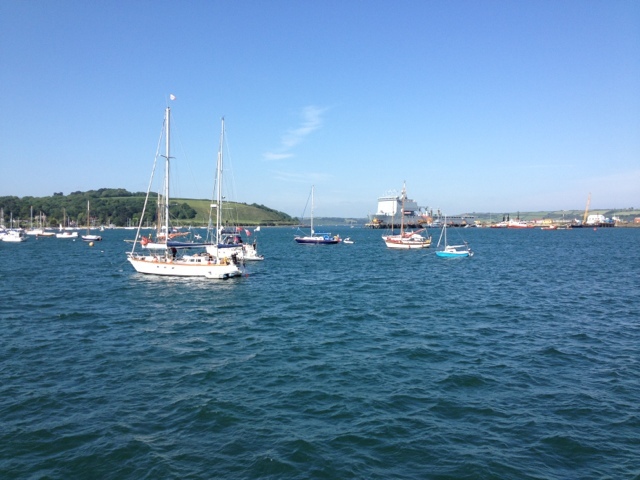 The trip across Falmouth Bay was exceptionally fine. On the wind for most of the way, 'Sandpiper' regularly clocked over 4 knots. The sky was blue, and there were small cumulus clouds casting shadows on the water, which in turn brought momentary gusts and exhilarating fun as I played the sheet. The flood was still making into Helford River at 15.30, which made it easy for me to get into a tiny cove south of The Voose without the use of the outboard. This little cove would provide protection from the expected SW Force 7. The forecast gives rain overnight and more rain tomorrow. Because of that prospect I beached the boat for more protection and for access to terra firma. 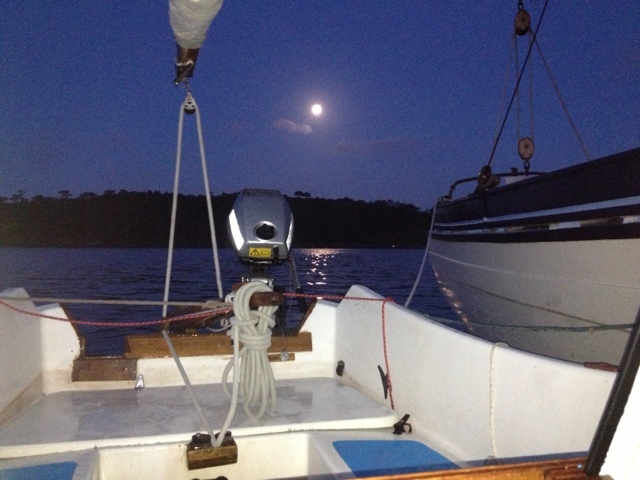 Seven days should be just right for playing around the Fal and Helford rivers. 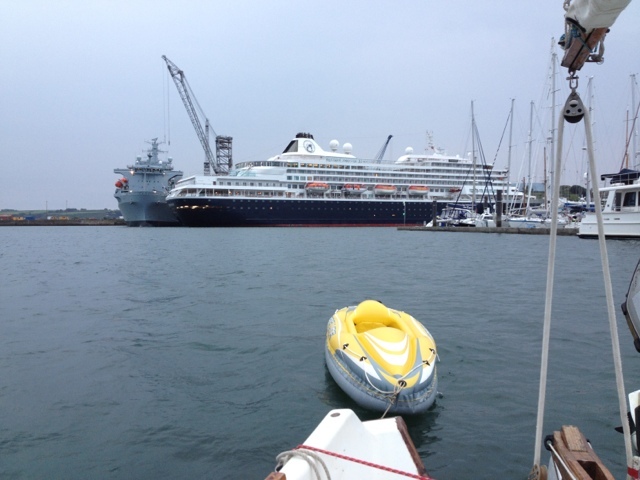 On waking, I was surprised to find that the 'Prinsendam', an eight deck* Holland America Line cruise ship, was docked only a short distance away. How she did it in the dark, I shall never know. 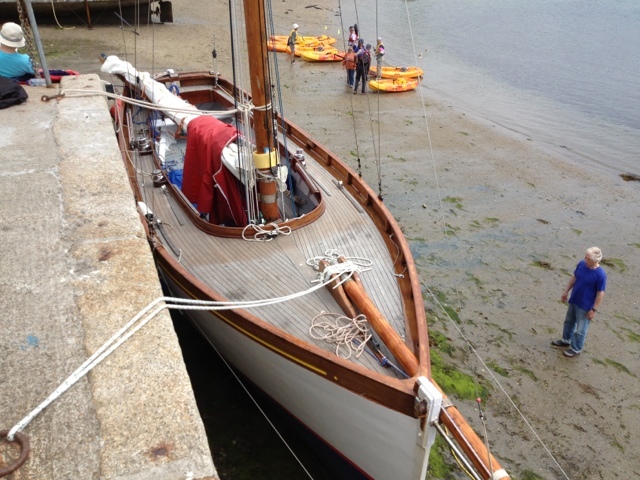 After obtaining petrol for the outboard and a length of fibreglass sail batten, I made sail and moved to St. Mawes where I anchored not far from the Harbour. One other yacht was there, and we were later joined by a third. Well sheltered from the north and east, there is one drawback, and that is the frequent passing of the St. Mawes Ferries to Falmouth and back. Like all workboats they never slow down when near other vessels. If they had to experience the violent motion caused by their wakes they might take a little more care. Time lost would be minimal. Please don't think I am grumbling, because it is my choice to be here. After dusk, all will be peaceful. 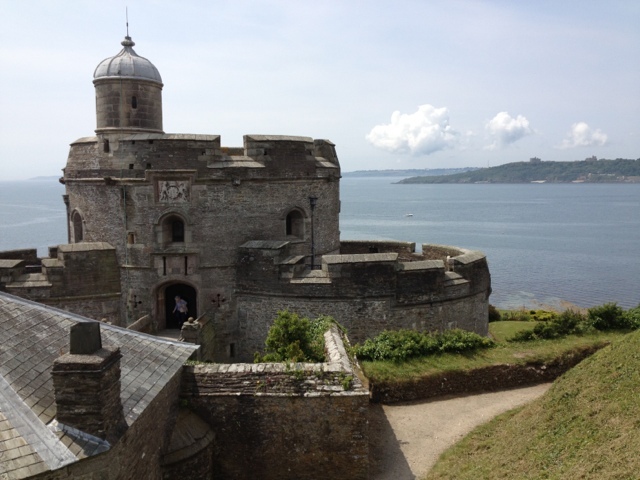 Tomorrow will see the start of the Cornish Three Peaks Race from St. Mawes at 12.00. 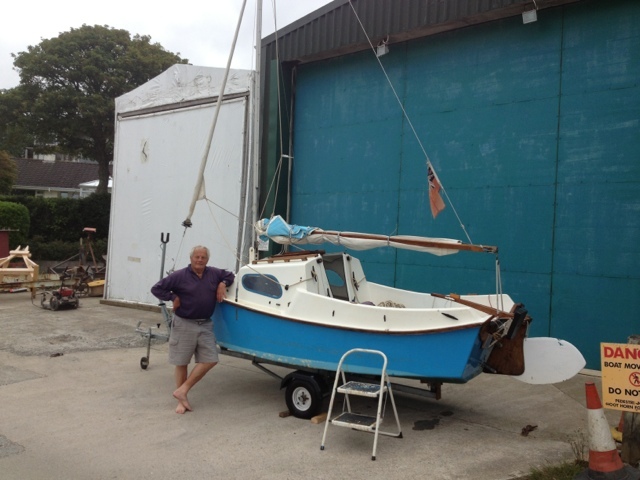 My friend's son will be a crew member aboard 'Tickled Pink', a Dragonfly trimaran taking part. Between them, crew members will sail 115 miles, cycle 130 miles, and run 29 miles. They will put into Newlyn, Fowey and Plymouth. 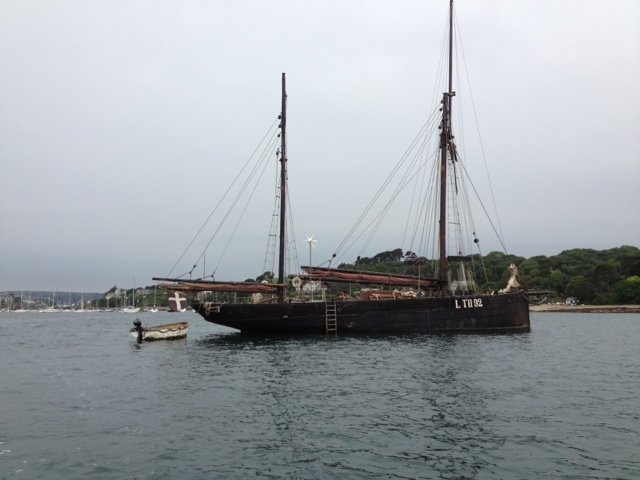 On my way to St. Mawes I saw a splendid ketch, 'LT 1192', the sort of vessel you cannot pass without having a closer look. Though threatening, the rain kept off until 13.10, whereupon I put the rubber duck upside down in a transverse position over the cockpit to keep her interior dry. By taking this action I shall not have to bale the canoe, nor will I have to sit on a wet seat. I am writing at 14.00, and the rain looks set for the rest of the day; in which case I shall be staying put. Now is a time for a snooze, and when I come to, I shall be ready for a tasty cup of tea, and ginger biscuits. What a lovely life I have. Don't I know it, and I am full of gratitude for God's kindness to me. * Eight decks includes the two lower decks and the very top sun deck. Please note that if my Friday blog does not appear, it is because I have a poor mobile phone connection. The same could happen on Saturday and Sunday. 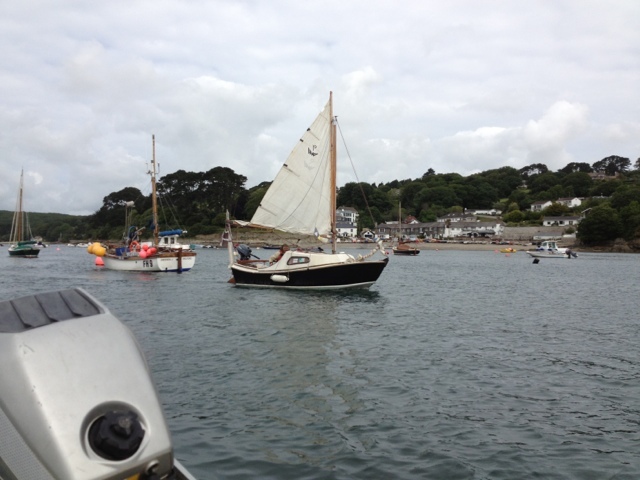 Well, all went well, and at 11.45 I arrived at Falmouth and anchored near the Visitors' Yacht Haven. By then the wind had picked up from zero to Force 5, and as I write, the northerly continues to buffet 'Sandpiper' into the evening. From mid morning the sun has been a blessing. 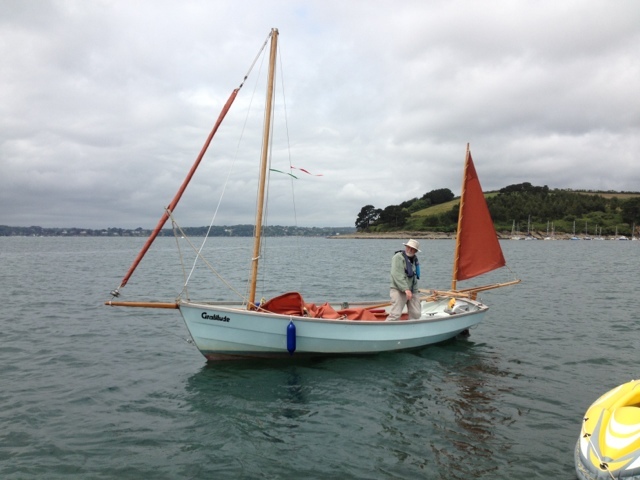 I set off at 05.40 using the engine, and for the most part the little Honda 2HP took the boat to Gerrans Bay, 4miles from St Anthony Head at the entrance to Falmouth Harbour. 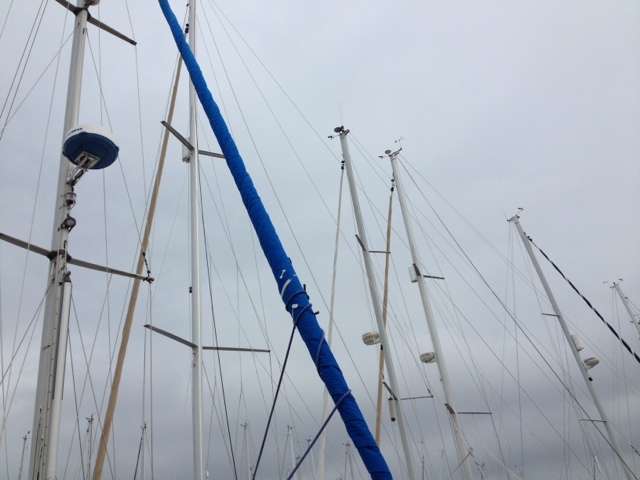 At St Gerrans Bay the wind came in strongly from the north, and it had me putting in a deep reef in the mainsail, balanced with a partially furled jib. The washroom facilities at the Visitors' Yacht Haven are very good. 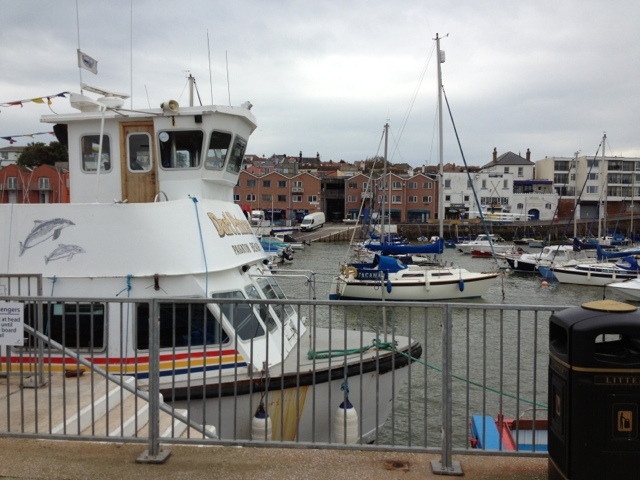 Having made myself respectable by shaving and showering I walked the short distance to the Custom House Car Park where I met an old sailing friend and his wife for tea and cakes at a nearby cafe. 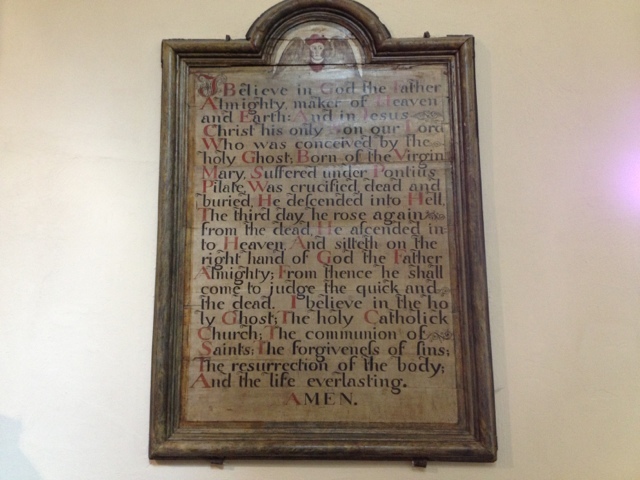 We have arranged to meet again next Wednesday evening for a meal, the venue being decided that morning. Where we meet will be determined by the weather and tide. 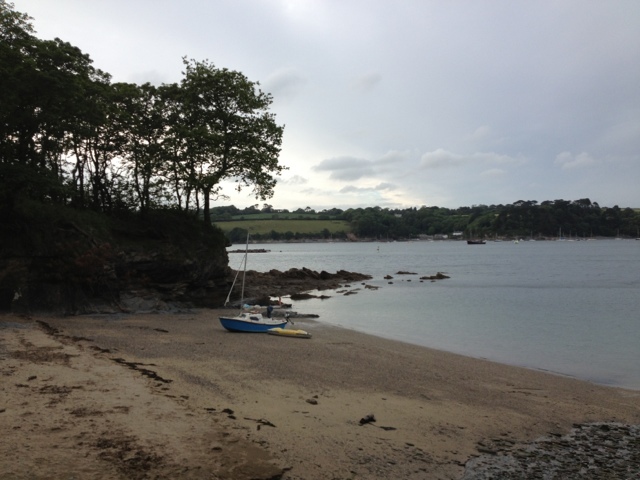 That gives me a week for exploring the Fal and Helford Rivers. What happens then remains to be seen. 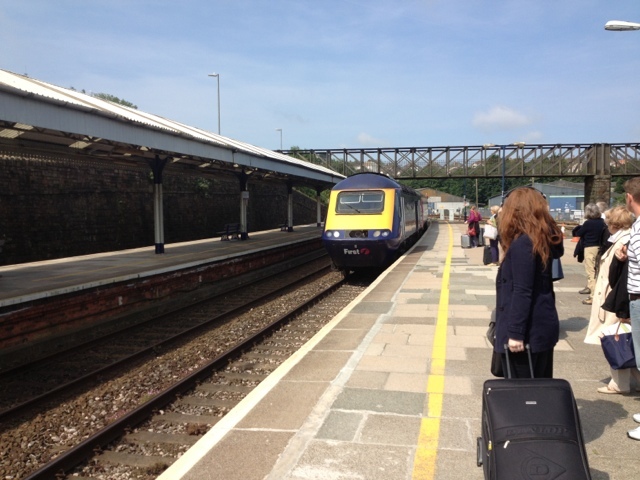 My main objective has been achieved by reaching Falmouth. I would only sail to the Scillies if an exceptional area of high pressure occurs. Therefore within a week I shall know if this summer's Pottering Cruise has come to an end. I'm pleased to say I did not contract 'Portitis', very nearly though. 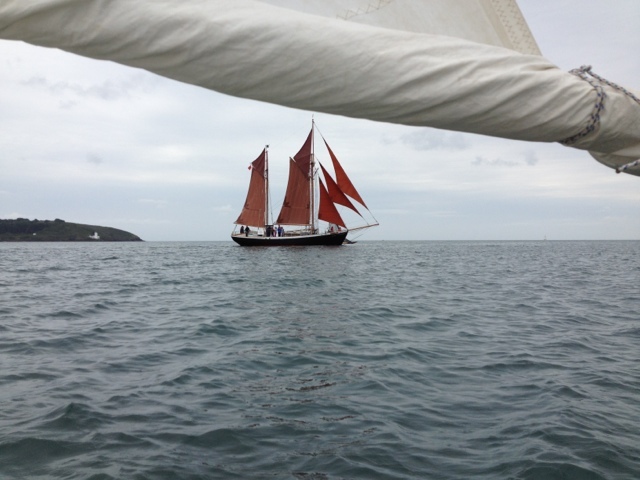 A dark dismal dawn saw 'Sandpiper' under full sail with a fair wind leaving the Cattwater. She was bound for Fowey, and that's where she put in after a fast passage, completing 22 nautical miles in just under 6 hours at an average speed of 3.7 knots. That sounds good, but the fact is the wind fizzled out, and the engine did most of the work with the help of the ebb. Motor sailing is never much fun. 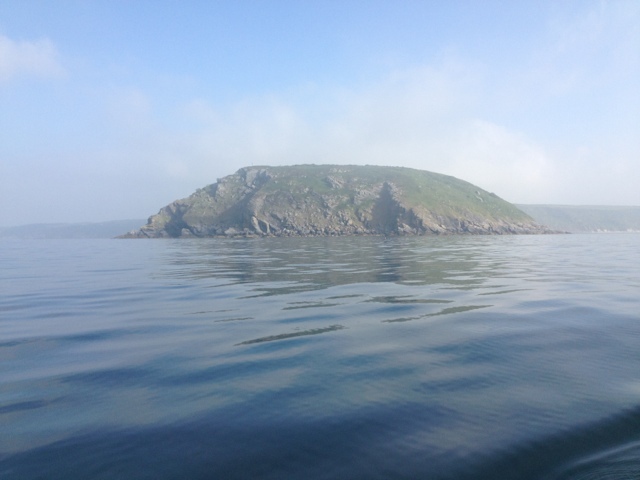 However, the navigation was interesting, because one of my GPSs failed to register any satellites; hence it was out of action, and to complicate matters there was fog between Looe Island and Udder Rock. The Inshore Forecast was absolutely right, even giving the location and timing - brilliant! 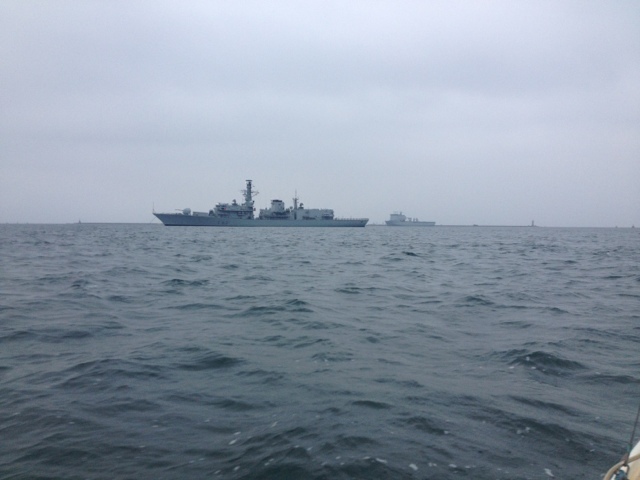 There was a Royal Naval Frigate and an Assault Supply Ship at anchor near Plymouth Breakwater. The former seemed to shadow me when I passed through the Submarine Exercise Area to the SW of Whitsand Bay. Four small fishing vessels were at work south of Looe Island. Looe looked quite inviting, especially as I could see I would be enveloped in fog further west, but I resisted the temptation, and kept to my original passage plan. The temperature dropped as I entered the fog, and very fine drizzle coated my spectacles. 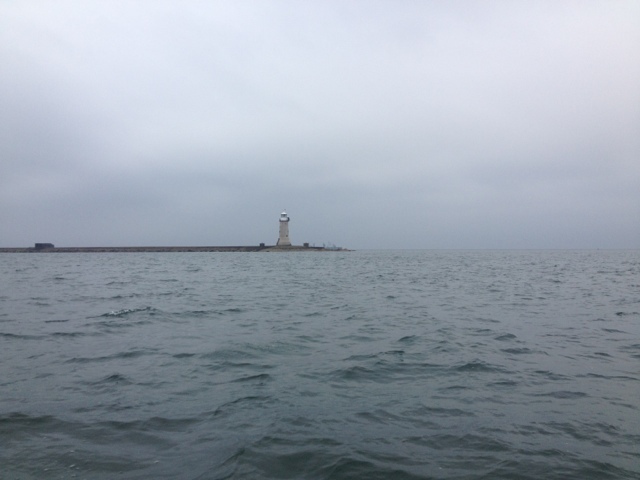 Not far from the South Cardinal Buoy marking Udder Rock, the temperature rose and visibility improved. Two identical gaff cutters were heading east, slightly inshore of me. Two more yachts soon followed them, all under motor. The top of Pencarrow Head, an anvil shaped peninsula, was shrouded in fog. Entering Fowey is always sobering, because Punch Cross Rocks to starboard are marked with a white cross, a signal reminding those approaching in a gale that but for the grace of God they could end up on those very rocks. Inside the entrance, whitewashed and cream buildings in tiers on the hillside to port brighten the scene, and around the corner to starboard where I have picked up a mooring is the pretty haven of Polruan. As I write at 15.45, sunlight penetrates amorphous grey clouds, paradoxically giving a warm glow to all around. Gulls squawk, the drone of a boat's engine and the sound of a high-pitched drill ashore indicate that I am not alone. What next? 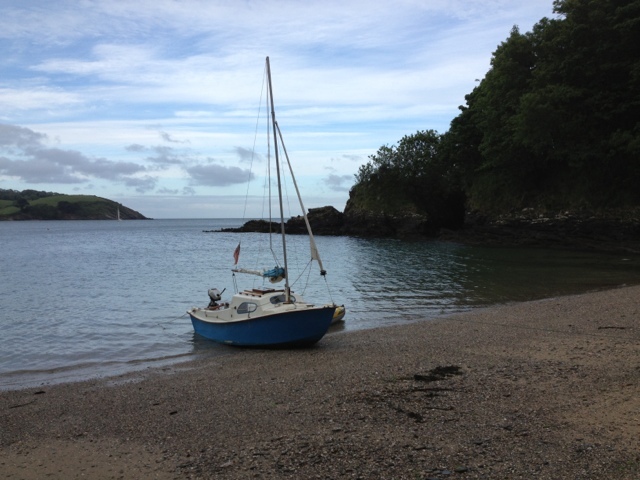 I've no concrete plan, but I want to sail to Falmouth , maybe tomorrow. I'll see what the weather brings. 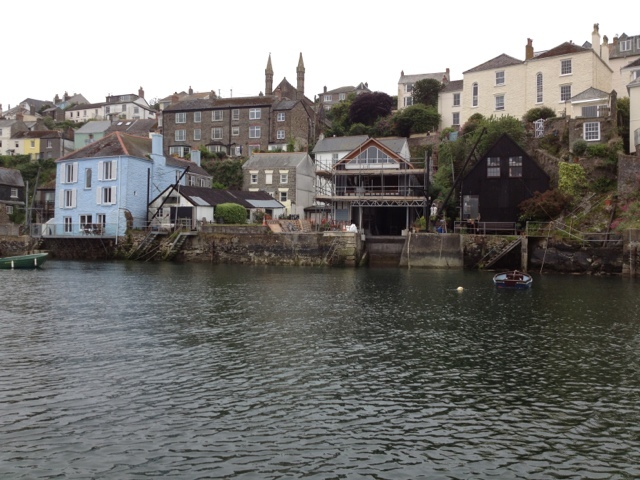 Incidentally, I cannot access my usual Internet, and if you are reading this today, Tuesday, 18th June, it is because I have purchased an hour's WIFI from Fowey Harbour Commisioner's Hub. I failed to get into the Harbour WIFI. So if you are reading this, I succeeded in getting into my 3 network. Things are improving; the clouds are getting higher; maybe blue patches will appear, and by tomorrow there will be bright sunshine. I live in hope. 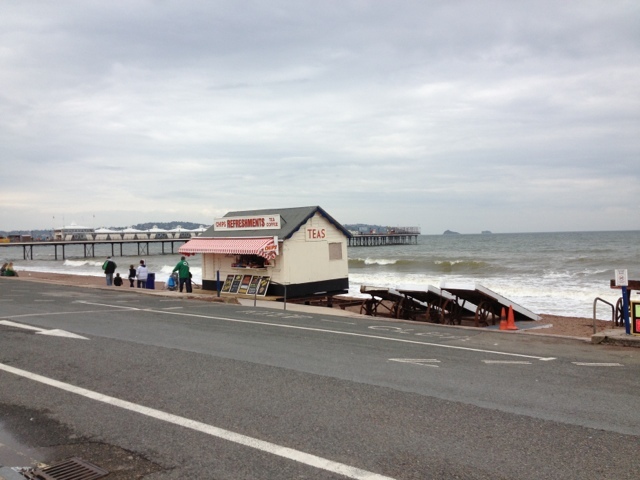 To fill in a few hours I caught the bus to Paignton. At the harbour people wandered to the entrance, took a look at the grey scene, and retreated. There were no takers for fishing trips or tours of the Bay. The Pier was almost empty. Waves crashed on the beach. By contrast, the pedestrian shopping precinct was crowded with shuffling holiday makers. Numerous fish and chip shops, gift shops and amusement arcades were doing a roaring trade. Even TESCO, LIDL and Iceland were doing well - but not much fun for the children, apart from eating ice creams and sweets. Talking of contrasts, the simplicity of 'Sandpiper' by comparison with larger yachts at the Yacht Haven is marked, especially when considering electronic aids such as radars, alarms of various kinds, navigational aids and radio communications. Many of them are equipped with radar reflectors, solar and wind powered chargers. 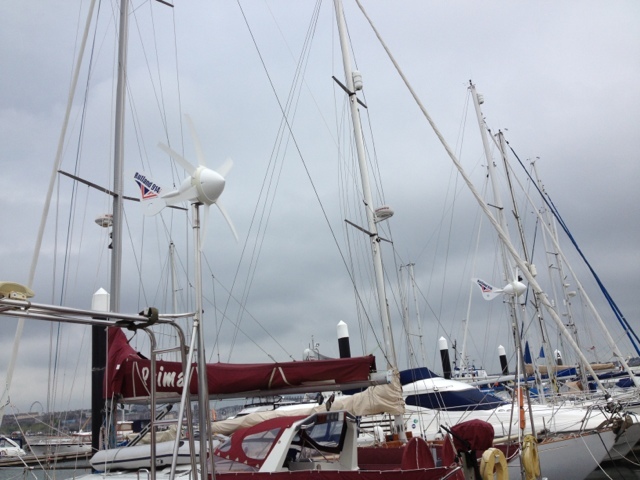 There are several with wind activated self-steering gears, and all the bigger yachts have complicated standing rigging, often with more than one set of spreaders and foresail furling. Some have life rafts. Give me simplicity. There are benefits all round. With 'Sandpiper' I have less to worry about, less to maintain and less expense. Furthermore, I am independent, being able to sail the boat without the aid of other people.